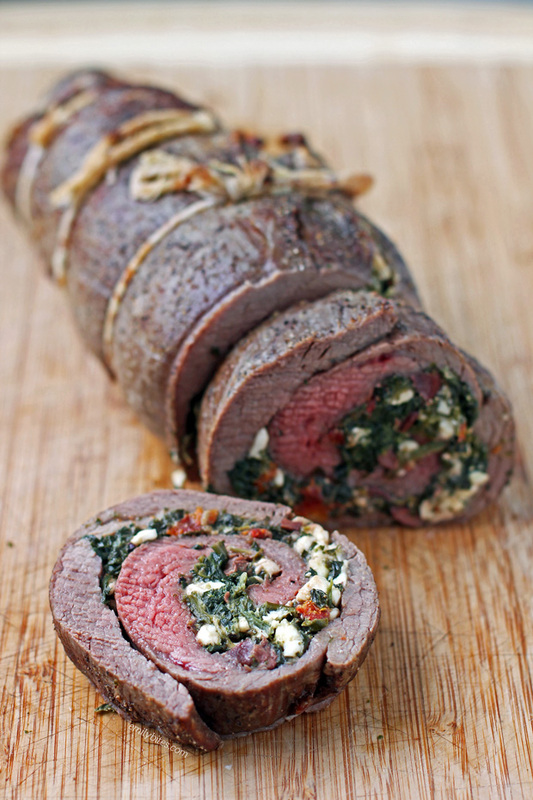 This Spinach and Feta Stuffed Flank Steak may look and taste fancy and complicated, but you’ll be pleasantly surprised to find that it’s quite simple! The steak cooks beautifully and the filling of spinach, feta, sun dried tomatoes, olives and fresh herbs is the perfect complement. My husband the meat enthusiast gave it two big thumbs up, and it’s hard to get his approval on steak that was cooked anywhere but a grill. He said “it’s so tender” and “wow, it’s super good” multiple times, so that’s a rave review. This is a great main course to make for company because it looks impressive and is deceptively easy – I love when that happens! Looking for more meat-focused main dishes? Try my Raspberry Chipotle Pork Tenderloin, Cream Cheese Stuffed Everything Chicken, Lemon Pepper Iced Tea Chicken, Slow Cooker Mustard-Rubbed Pulled Pork, Cheesy Bacon BBQ Chicken, Slow Cooker Beef Braciole, Chicken Milanese with Spinach and Burst Tomatoes, Slow Cooker Beef Stew, Roasted Pork Tenderloin with Ginger Peach Sauce, Pizza Chicken Roulades, Keema (Indian Spiced Beef), Bacon-Wrapped BBQ Meatloaf, Shredded Mexican Chicken, Slow Cooker Balsamic Beef, Chicken Piccata, Cheesy Chicken and Stuffing and so many more in the Main Dishes category of my recipe index! *You will also need twine to tie the meat once it is rolled – ask for it at your meat department! Pre-heat the oven to 425. If you are butterflying the steak yourself, here’s a handy how-to video. Place the butterflied flank steak on a cutting board. You want the steak to be between ¼”-1/2” thick. If there are parts that are unevenly thick, try to flatten them out with a meat mallet for even thickness. Season by sprinkling a bit of salt and pepper over the steak. In a large mixing bowl, combine the spinach, sun dried tomatoes, olives, Feta cheese, basil, parsley, ¼ teaspoon of the garlic salt, ¼ teaspoon of the black pepper, the ¼ teaspoon of salt and the egg yolk. Stir until well combined. Turn the steak if needed so that the “grain” of the steak is running left to right in front of you. Spread the spinach mixture evenly across the surface of the butterflied steak, leaving an inch or so at the back bare. Starting with the side closest to you, roll the steak tightly forward, around the filling, until the roll is complete. 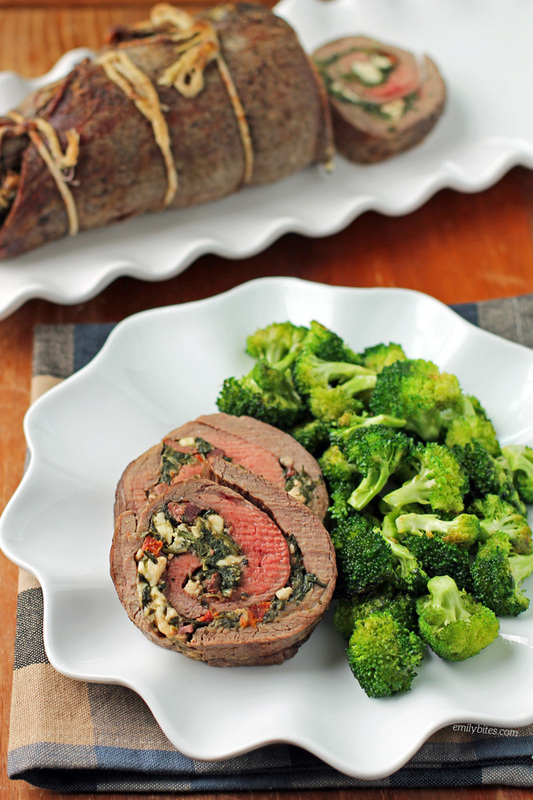 Use twine to tie up the rolled steak about every 2 inches. If any filling is escaping out the sides, make sure to tuck it back in. Transfer the stuffed steak roll to a 9×13 baking dish (or similar) and use a pastry brush to brush the olive oil all over the surface of the steak. Sprinkle with the remaining ¼ teaspoon garlic salt and ¼ teaspoon black pepper. Place in the pre-heated oven and bake for 35 minutes*. Turn the oven to broil and broil for 5-10 minutes. Remove from the oven and allow the steak to rest for 15 minutes before removing the twine and slicing. Cut into 12 slices with a serrated knife and serve. *This cooks the steak to around medium in the center, if you want yours to be cooked further you can add a few minutes (don’t go crazy adding time though, the steak will continue to cook as it rests). This looks and sounds incredible! I’ll try it out on my family, and then I’ll make a double batch for an upcoming (special occasion) dinner party. Since we’ve never been disappointed with any of your recipes, I’m sure that this one will also be a winner! When you say Grain – Left to right..
does that mean the grain should be vertical or horizontal? that one confused me. I am going to try to pull this off on Sat, should be a hoot.. I am leaving out the olives as I am not a fan, any ideas on a sub for that ingredient? Thank you so much for the recipes I am a beginner but I have cooked a few of thee and some of these have really knocked my wife’s socks off! Hi Thomas! Left to right as in side to side/horizontal when you’re facing it. I hope that’s more clear! I hope you and your wife both love this one! I think you can skip the olives altogether, add more sun dried tomatoes, or add capers or artichokes or something else yummy and salty. Thanks for your comment, let me know how it turns out! Do you think blue cheese could be substituted for the feta? Would that help with the omission of the olives as well possibly? My husband really doesn’t like feta. We love all of your recipes, we have the cajun chicken pasta for special occasions in our household! I need to practice on the roll up, but it turned out pretty good! I subbed in artichoke for the olives and had the steak butterflied at the butcher. This was excellent with Broccoli and white potatoes. Delicious, what a great idea. Next time, I’ll put the thinner flank steak portion in the center, not the outside, or make two rolls. Made this & it was wonderful! Used fresh spinach instead of frozen. I have half left over. Any ideas on how to reheat it? Question. I would like to make this for Christmas dinner. One of the guest has an egg allergy. I’m assuming the egg yolk is used for binding it al together. Any suggestions on what else I could use or if it would be a mess if I just left it out? Hi, I want to make this for Christmas dinner, and I am wondering the reason for the dried tomatoes and not the ones packed in oil. The ones in oil were all I could find :/ If I drain them well and pat them dry with paper towels, do you think that would still work? Thanks! The reason is simply to save on calories and points from the oil they are soaked in, the recipe will definitely still work with the oil-packed ones! Hi, I think I’m going to try this for Christmas. Do you think I could have it all rolled and ready to cook the day before? That way I just have to put it in the oven on Christmas? I definitely think that would work! I made this for our Christmas Eve dinner. It was so easy and perfectly delicious! This may become a tradition. I substituted some roasted red pepper for the sundried tomato since some family members don’t like tomato.